Send a package from your post office to other post offices along the trail (use the text from AWOL’s The AT Guide). 2. Send a package from your post office to a hostel, hotel, outfitter or other trail-friendly business (using the text below from AWOL’s guide). I would highly recommend using this method over sending packages post office to post office. Many businesses along the way allow hikers to send packages for free, the cost of staying at the business or for a small fee. These businesses are marked in AWOLs Guide and the A.T. Thru-Hikers’ Companion by the Appalachian Trail Conservancy. 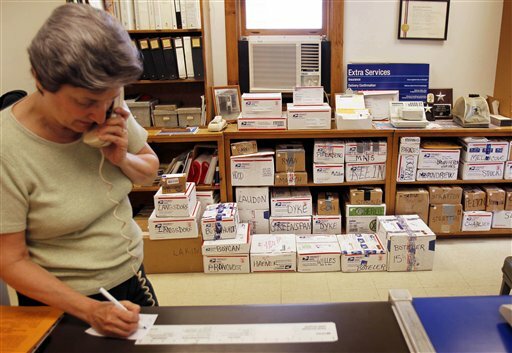 These businesses typically have much longer hours than post offices. There’s nothing worse than having to alter your schedule and speed up or slow down to pick up a package at the post office. And due to lack of funding, many post offices (especially those in the small towns you predominately will be hiking through) are having their hours of operation cut shorter and shorter. Deciding where to send myself packages was one of the most confusing aspects of planning my 2014 hike. Looking back on it, I wish I had not even bothered. There’s no way to know the best places to stop until you are actually on the trail. You can always find a place to resupply, even if it’s a gas station. Though surviving on gas station food for days is not awesome, the convenience of that gas station will probably outweigh the effort you could spend to make it to a mail drop during open hours. And you’re not going to know exactly what you’ll need or want during the hike, so you’re probably going to end up having to go to that gas station for some food anyway. The contents of a mail drop. I never want to eat another ride side again. You’re also not going to know the towns you will want to stop in until the time comes. Nothing’s worse than having to go into an inconvenient town to pick up a mail drop, especially if you’re hiking in a group of people who do not need to go into that town. That being said, I did send myself a few packages. They do come in handy if you need certain items (like medication) that you can’t get at stores. Below are a few towns in which I was thankful to have a package. Fontana Dam, NC: This is basically a resort town and they only have a very expensive general store and a gas station. It also is home to the Fontana Hilton and is the last stop before entering the Smokies, so many people take a zero day here, which gives you more time to be in town during post office hours. However, the general store and gas station definitely make it possible to avoid sending a package here. Harpers Ferry, WV: Harpers Ferry is home to the ATC headquarters, a few great hostels and an outfitter, but surprisingly has no place to resupply. The nearest place is a 7-11 that still requires a hitch. Both hostels (Harpers Ferry Hostel and the Teahorse Hostel) allow mail drops. Monson, ME: This is the last stop before the hundred mile wilderness but has no grocery store. Resupply options are limited to a convenience store and two hostels and–unless you’re planning on paying for a mail drop in the wilderness–it is the last place for a convenient resupply until Katahdin. Both hostels in town (Shaw’s Lodging and Lakeshore House Lodging and Pub) allow mail drops. I just read this and Zach’s excellent post from a couple years ago. Fantastic advice as I prepare for my thru-hike this year. A question for you all… with the proliferation and economy of Amazon Prime and the abundance of items you can get from them (plus the near ubiquity of internet these days), do you have any advice on possibly using Amazon to do “mail drops”? As in, forecasting a need from one town, and having it delivered to the next by the time you get there? Thanks and thank for the fantastic articles! With regards to prescription medication, I carry an open script from my Doctor for my heart medication so if I run low or out, I can simply stroll into the nearest CVS or WalMart and get it filled. Just remember to omit the date and be sure that the Doctors full name, practice address and phone number is printed on the prescription slip. Never had any problems and swear by this if you are a hiker that requires daily meds to carry on. Thanks for this super helpful article, Jessica! Monson, ME has hiker resupply at Pete’s Place. It was open in 2014, but it may have taken a season for the owners to learn what things hikers really need. 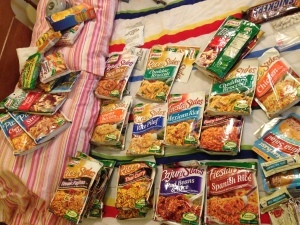 I was there in August (2015), and he had things like Knorr pasta sides, Ramen noodles, Nutella, tuna in foil, Smart water bottles (that fit the popular Sawyer Squeeze filter) single ziplocs for sale, Cliff bars, etc. in a small room with items just for hikers. Harpers Ferry, WV – the outfitter has a small selection of hiker resupply, similar to above. Sometimes hikers miss the little alcove with these items, or miss the outfitter altogether because the sign for “General Store” is so much more prominent than the “outfitter” sign. There’s so much history and scenery in Harpers Ferry (and places to buy ice cream or beer) it’s easy to get distracted. There are also 3 hostels now in Harpers Ferry: Teahorse Hostel 1/2 mile west of ATC HQ, Town’s Inn 1/2 mile east of ATC, and the Harpers Ferry Hostel, which is 5 miles trail north by foot from ATC, but sometimes you can find a local shuttler to get your there. They won’t all 3 be open for spring again until April 15. If anyone is on the fence about whether to buy along the Trail or purchase on-line, it’s worth considering the very positive impact your purchases have on these tiny local communities.